John Carney doesn’t just make movies where music is part of the story. He makes movies where you need to pay as much attention to the lyrics as you do to the dialog because the lyrics help tell the story while the music lifts and shapes and transports the characters – and us – to a place that just feels different and more refreshing — and leaves all of us changed by the experience. He did that in 2006 in a small movie called “Once” and he does it again here. Eight years between movies? This one is worth waiting for. It introduces its characters by telling of their meeting…and then backing up and telling it again…and then backing up and telling it from a different point of view… and it all seems so imaginative – and so right. 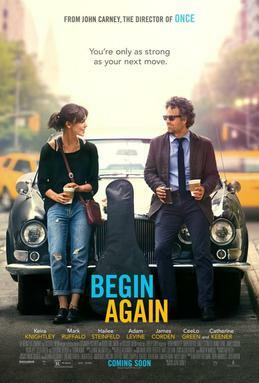 This becomes a story of these two very different people – Dan (Mark Ruffalo) is gruff, pushy, a loser and a lush, cynical but with contacts in the industry who owe him a favor; Greta (Keira Knightley) is fragile, idealistic, dubious and doubtful, willing to go along because she wants her songs heard “her way” and he’ll let her do that. They’re both struggling to get back the music career they once had…at a time when the music business is changing beyond recognition. Ruffalo is well cast with his careless sense of dress, his unshaven look, his smoking and drinking and reliance on vulgarity to get his point across. Knightley is so classy, but fragile. Her voice has a tear in it, her lyrics seem written on tissue paper, her songs are whispers in the darkness, a compass to guide her life. This is a movie that will lift you up and carry you away — and its music will stay in your head and in your heart long after Greta and Dan have finished their recording. This is a terrific little film.